An effort is underway by the Iowa Grocery Industry Association and environmental organizations to cut back on the number of plastic grocery bags that are used in stores across the state. Association president Jerry Fleagle says the "Build with Bags" program has a couple of goals. He say they want to double the number of plastic bags that’re recycle over the next 24 months, reduce the consumption of plastic bags and increase the use of reusable bags. Fleagle says they will also develop and institute a program to help parks and schools buy products made out of recycled plastic bags. Fleagle says there’s a lot of work to do to achieve their goals. 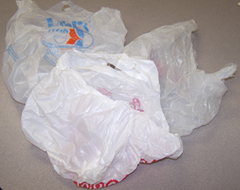 Fleagle says there were over 550-million plastic bags used just in the grocery industry alone in Iowa last year. He says they are still compiling the numbers of how many bags are recycled, and the goal is to double that number. Many stores now sell the reusable cloth bags, but Fleagle says they need to get people to remember to take the bags with them. He says getting people to use the reusable bags is one of the biggest challenges, and they will come up with some "best practices models" to give to stores to encourage the use of the reusable bags. Fleagle says those things include stickers, signs and window clings to remind people to bring the reusable bags with them. Fleagle says there are things like benches that are made out of recycled plastic bags and they want to encourage the use of such products. Fleagle says they will set up a program that will make it affordable for schools and parks to use those products instead of wood products. Fleagle says there are environmental benefits to cutting back on plastic bags, and there are other benefits as well. He says less plastic bag usage helps stores and consumers by keeping the costs low. Fleagle says consumers already benefit at many stores by getting credit when they bring in their reusable bags. The grocers are working with Keep Iowa Beautiful, the Iowa Department of Natural Resources and Metro Waste Authority to get the program going.